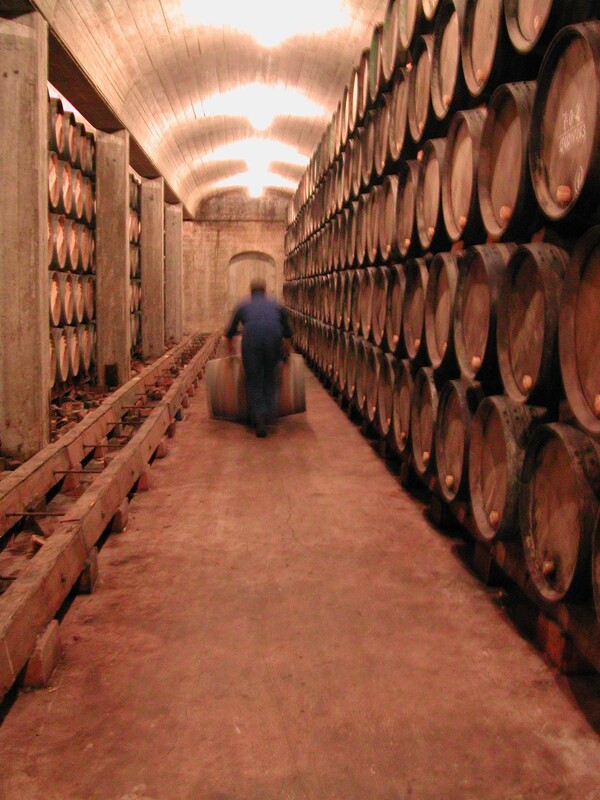 Above: A worker rolls a barrel through the wine aging room at the Muga bodega. 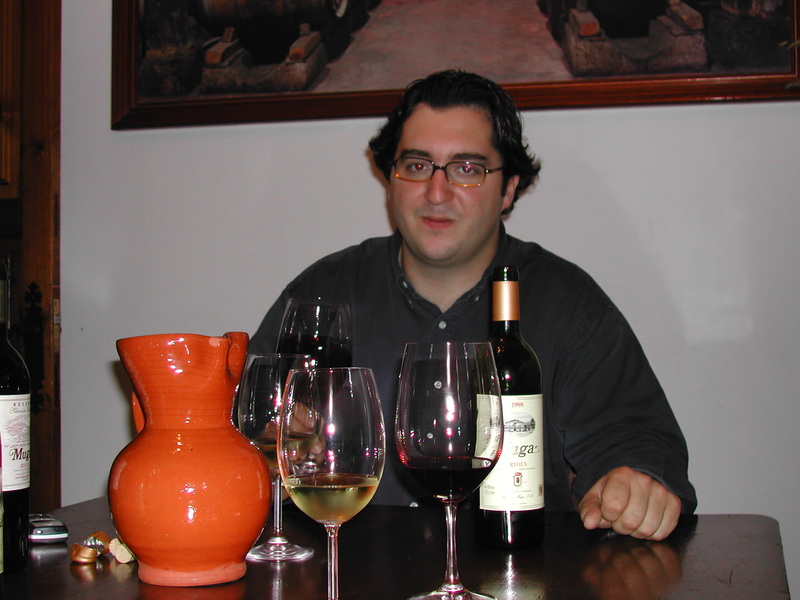 HARO, Spain—Juan Muga peers through his black horn-rims as he pours red wine into the tall stemmed glass, then swirls it about. New to wine tasting and seated next to a part owner of one of Spain’s noted wineries, I presume that Muga (pronounced MOO-gah) is studying this sample for clarity or color. But without so much as sniffing the wine, he pours it into a jug, then tilts the newly opened bottle to refill the glass. Swishing the wine was simply to clean the glass “so there is no smell left from the dish washing,” Muja tells me. This is one of the lessons I learned touring three wineries in Spain’s acclaimed La Rioja province. An hour in the educational Oenology Center in this busy city filled in a few blanks. 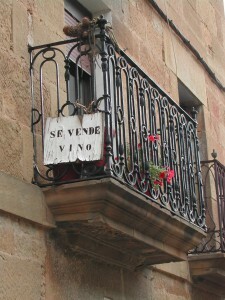 The simple sign on a balcony says wine is for sale here. La Rioja boasts more than 200 bodegas, a generic word used to mean a winery’s production facility, warehouses and even retail stores. Winemaking in Spain dates to the Roman occupation 2,000 years ago. La Rioja, in the northeast, is a huge valley between two mountain ranges and irrigated by three rivers. To maintain quality of production, a powerful provincial agency that was Spain’s first for wine production establishes rules such as the maximum number of grape vines per acre and the maximum amount of wine (18.5 gallons) that can be produced from each 220 pounds of grapes. There are three distinct sections of La Rioja: The best for grape-growing are Alta and Alavesa in the west and north, where Haro is; the other is Rioja Baja. Production facilities range in size from that of a multicar garage to the multistory bodegas such as Muga’s, one of more than a dozen large wineries in Haro. Before they are harvested, however, specific areas of grapes have been sampled for 15 factors, including acidity and sugar content, to determine when the grapes are ripe enough to be picked. Because Muga is a large producer (about 1.2-million bottles annually), only 50 percent of the grapes used come from its vineyards. The rest are purchased from farmers. The most commonly used grape of six varieties grown in La Rioja is the tempranillo, favored for its bold taste in red wines. The most common of the white grapes is the fruity-tasting viura. When the harvested grapes are brought to the big wineries, the stems are removed and the grapes are placed for 10 to 14 days in oak casks to begin maceration, the dissolution of the grapes into liquid. This product is then pressed, and the skins and seeds are filtered (a high-alcohol form of schnapps or grappa is made from this). Yeast is added to the grape juice to boost its alcoholic fermentation. A number of bodegas place this liquid, called must, in stainless steel vats, which are cooled to an optimum temperature by running water through exterior jackets to slow the pace of fermentation. But other wineries, including Muga, keep all the chemical activity in oak casks. The smaller casks hold about 58 gallons, the big casks about 4,160 gallons. The oak comes from Kentucky and Tennessee or from France; the French wood is said to lend a spicy taste to the wine. The advantage of oak is that the fermentation and aging occur more naturally (the wine is said to be breathing through the wood) and the liquid absorbs some flavor from the oak. To better maintain consistent tastes, barrels are discarded after about 10 years. Traditionally, the Spanish aged their wines in oak much longer than other winemakers. The long time in wood and bottle made the wine easier to drink when it was released for sale. Today, there is more variety in aging. Wine is 85 to 90 percent water, but it contains an astonishing amount of other ingredients: three kinds of alcohol, phosphate, chlorides, sodium, magnesium, several acids and even vitamins B1 and riboflavin. As it ages, wine is shifted between smaller casks, to remove sediment. This transfer can be done by pump or by draining from a higher barrel to a lower one, which is called racking. “Racking takes much more time, but when it is aging, the wine does not like the pump,” Muja told me. Ultimately, the wine is bottled and kept in climate-controlled warehouses, another step in aging that varies. In La Rioja, the wine-production agency dictates how long vintages must be maintained in cask and then bottle to qualify for one of the three classifications of red wine. Until the bottled wine reaches those requirements, the agency will not issue the labels that attest that each bottle has met the aging standards. The basic requirement is at least one year in the cask, two in a bottle. This wine is classified as crianza. The aging increases, up to the requirements for the top of the line gran reserva: a minimum of two years in the cask, then three in the bottle before release. Co-owner of a large winery his father founded, Juan Muga suggests ignoring the old adage about drinking red with meat, white with fish. The temperature around the private stock is kept at 55 degrees, but Muga said that in your home, it is more important to keep the temperature consistent and the bottles out of light that can cause wine to lose flavor. Nor is it mandatory to gently cleanse the palate between wines at a tasting; for our sampling, Muga and I munched on spicy sausage as well as bread. 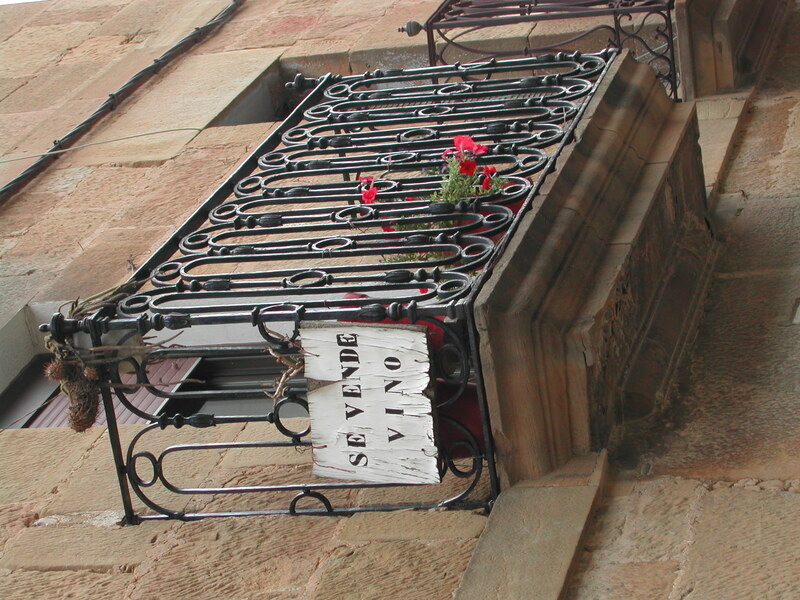 The tourism office in Haro, the wine capital of La Rioja, has English-speaking staffers who can provide a list of 20 area bodegas, their locations and tour options. But even wineries that do not have tours usually welcome drop-in visitors and will sell bottles. The tourist office also has city maps in English that locate the bodegas, prime restaurants and hotels, and major churches. Beyond the Rutas del vino de la Rioja pamphlet—three routes to dozens of bodegas in the province—the tourism office can also provide maps for visiting historic church structures, castles, small towns and the areas in which Europe’s greatest collection of dinosaur footprints are found, more than 5,000 tracks. For this last, you will need some command of Spanish to find the tracks. For more on the province, go to www.beronia.org/pueblos.htm, which is in English. Also look at the national government’s site, www.tourspain.org. For the province’s wine information, go to www.lariojaturismo.com/turismo_enologico/index.php. The Muga site is www.bodegasmuga.com/eng/home_eng.html.